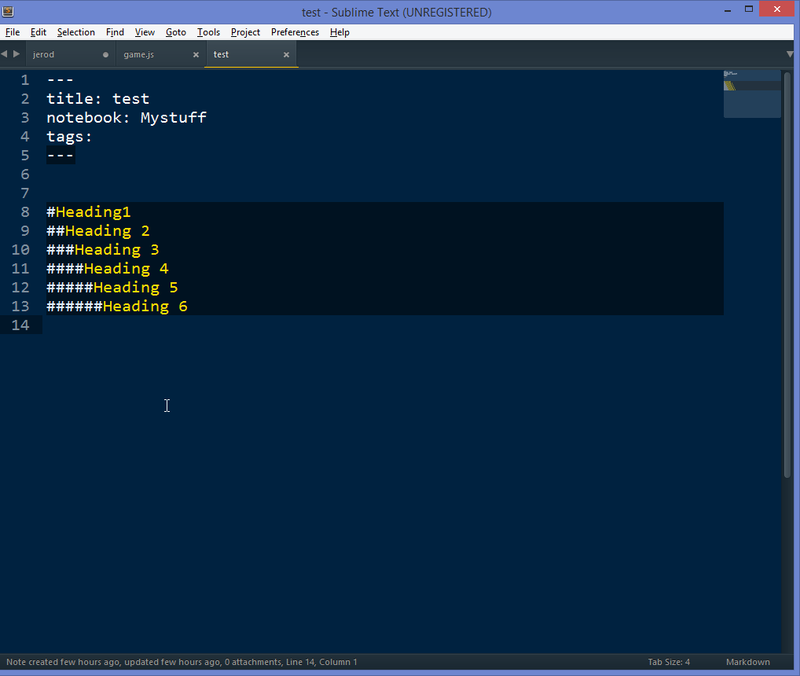 Do you use Sublime Text 3 for your coding/editing and would love to use it to edit Evernote notes? This plugin is for you! Sublime Text 3 is a popular text editor. This plugin allows you to work with your Evernote notes using the convenient Markdown notation. From a quick look, the installation process is not for the technologically faint-hearted, and presumably using the plugin means that all my input goes through your hands on its way to Evernote. What levels of security do you support? If you are already using Sublime Text 3 with Package Control the installation procedure should be as easy as Ctrl+P > Install > Evernote. and presumably using the plugin means that all my input goes through your hands on its way to Evernote. It depends what you mean by "my hands"
Not a single bit of your data will leave your editor unless you issue Evernote related commands, in which case your data will be sent directly to Evernote's servers through their own libraries. Everything the plugin does is done locally on the client's side, apart from downloading and uploading notes from/to your Evernote account. What levels of security do you support? Unfortunately, due to restrictions to some of the libraries shipped with Sublime Text the plugin does not support https. This is going to change when Sublime Text will add support for it. The authentication is done using Developer API Tokens. Ha, this is really cool! Sublime is my favorite editor. I might not use the web interface ever again... this is much more convenient. One thing that seems a little unnatural is having to select "update note" from the menu instead of Ctrl+S to save the changes. @gazumped: you are welcome btw the next version is going to support HTTPS provided you use the new Package Control version 3! @foonote: I did not want to override the ctrl+s binding since it's such a basic one, plus somebody may want to save the note to a local file in addition to updating the cloud version. This would bind ctrl+s to "Send to Evernote" if you are in a view displaying a new note, "Update Evernote note" if you are in a view displaying an existing note. I just released a new version (2.6.0). support for HTTPS for Package Control v3 users. The full details and documentation can be found in the wiki. For me this is a more interesting app than Marxico as everything is done locally. The question I have is: can notes made with Sublime Text be exported as markdown notes? On your website page https://packagecontrol.io/packages/Evernote the first use link (screenshot) returns a 400: invalid request message. Hi DutchPete what do you mean by "export" a markdown note? Once you write a note using markdown syntax in Sublime Text you can do what you want with it: you can save it to a file, use a converter on it to get a preview (there are ST plugins for that as well) etc. What I mean is that, after having saved many notes from ST to Evernote only (i.e. not having saved them to an external folder), one might want to export them at a later stage. Is that possible, or can they only be exported as enex or HTML files? Well, the plugin allows you to save notes to Evernote as well as opening them. So, for instance, you can open the command pallette, write "Open Evernote" select the entry, navigate the desired Notebook, select the note from the list et voilà you get the markdown of your note. From there you can use the note's contents as you prefer. Any way to make MarkdownEditing the standard syntax, when opening an Evernote Note in sublime text? Yay! Have been looking for this a while now. Thank you so much! Hey nice work! I've been looking for something better than the web interface that will allow markdown to be used for composing notes. It was a pleasant surprise to see that it has been provided through the editor that I use daily. Very well done. This is something used pretty often on github, as I'm sure you're aware. Hi P-TAK14, the feature you are requesting is already implemented by the plugin, even with syntax highlighting. Wow! Well, brave new world. I'm glad to find a consensus that there is a solution to this persistent weakness of wheezy or no markup. I'm looking forward to reading up more and hoping to join ranks. TIA! The '#' heading tags do not seem to be working. Is this supported in this plugin? Is there a setting or option that needs to be enabled? 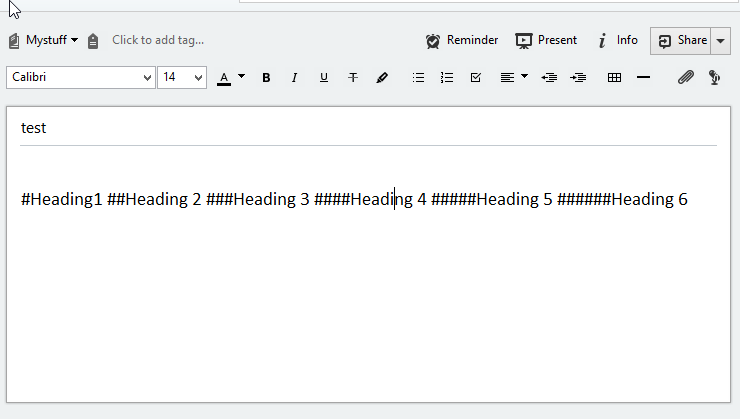 Note, other markdown functions seem to work but not this # heading function. Odd that I don't have a Packages/MarkdownEditing folder even though I have the add-on installed (via package control). I downloaded the file here and just added it to my Packages/User folder. It works however, when activated the metadata in a note no longer autocompletes, which is a massive drag. Has anyone else managed to get this working with MarkdownEditing syntax and the metadata auto complete working? @Panda_Bear The plugin uses the `Evernote.tmLanguage` syntax definition by default. It defines the scopes for the metadata headers and then imports the gfm markdown syntax (from MarkdownEditing) if installed and the default one. Hence you should be able to see the MarkdownEditing highlighting and get the autocompletion (which only works on the scope defined by Evernote.tmLanguage). Cool, it's a pretty good plugin just what I need it! thx.